iBall has launched iBall Imprint 4G tablet in India. It comes with a unique integrated Fingerprint Sensor, the tablet is STQC certified for Aadhaar Verification. This not only serves the purpose of scanning and recording the details but also verifies the identity of a person. It has a 7-inch (1024X600) IPS HD display powered by the Quad-core 1.3 GHz ARM Cortex A53 64-bit processor with 2GB RAM and 16GB storage which is further expandable up to 32GB. It runs on Android 7.0 Nougat, On Camera, it has a 5MP AF rear & front camera with LED Flash. connectivity options include 4G VOLTE, Dual SIM, dual-band Wi-Fi (802.11 a/b/g/n), Multiple USB Ports (1x Micro USB Port, 1x Normal USB Port), USB OTG, Micro HDMI, Cast Screen, Bluetooth 4.0, USB tethering. Optionally, it also comes with LAN port. The Tablet sports DC charging port for charging purpose so that USB ports are free to be used for peripherals connections and data transfer. 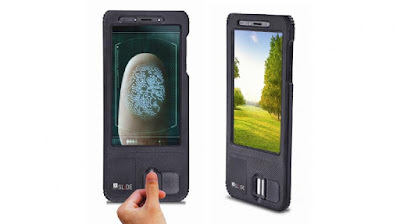 It packs a rugged build and is also available with STQC Certified Iris Scanner. Packed by a 5000mAh battery and supports a multi-language keyboard with 22 regional languages. It comes with several additional features including GPS, A-GPS, Phone Calling, G-Sensor, Light Sensor, Magnetic Sensor, etc. The iBall Imprint 4G is priced at Rs. 18,999 and comes in black color.